Charity Challenge – week 1 an insight! This is a round up of the emails sent out to my mailing list with a little insight into the way my mind has been working day by day….possibly not the best thing to share sometimes. I started on the day the Badger culls recommenced so Badgers where everywhere. It therefore seemed fitting to start with Badgers. I find it difficult to paint one at a time I painted 3. This raised an interesting issue, does painting 3 Badgers constitute 1 Wild Thing or 3…? I pondered the question and decided that all the paintings need to be of a different wild thing to count towards the 100! Inspired by my trip over the summer to Skokholm Island. 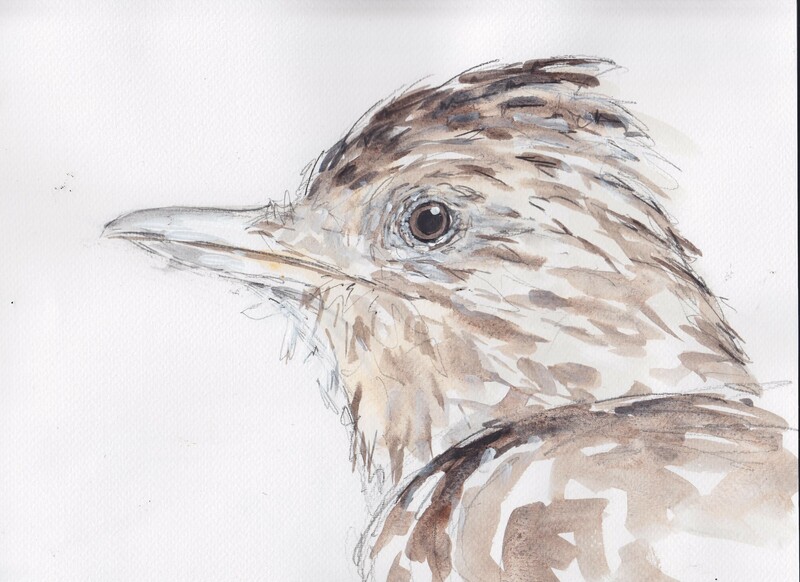 Skylarks song seemed to be all around us at times, you can read their wonderful blog here. Sadly they are in decline due to the changes in land management and farming practice, you more about them from the RSPB here. 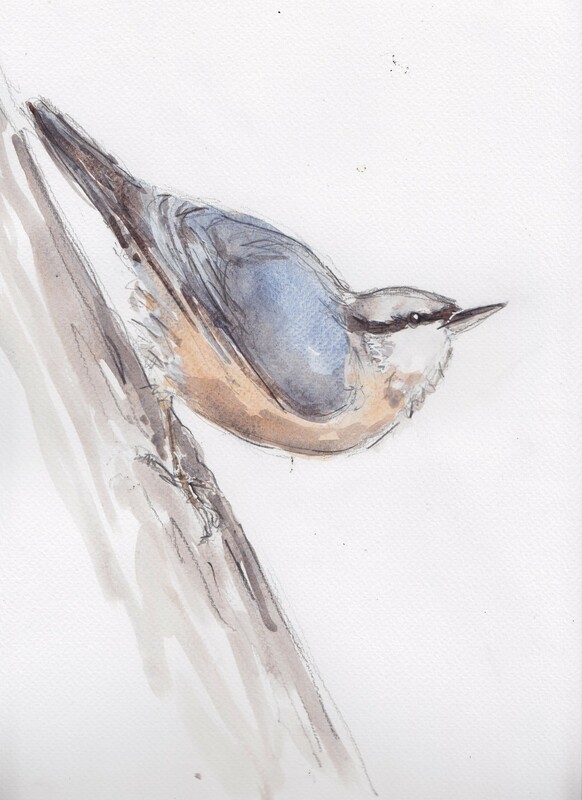 My painting was of a little Nuthatch seen in a local nature reserve called Pendarves Woods it is wonderfully managed by the Cornwall Wildlife Trust you can find out more by clicking here. 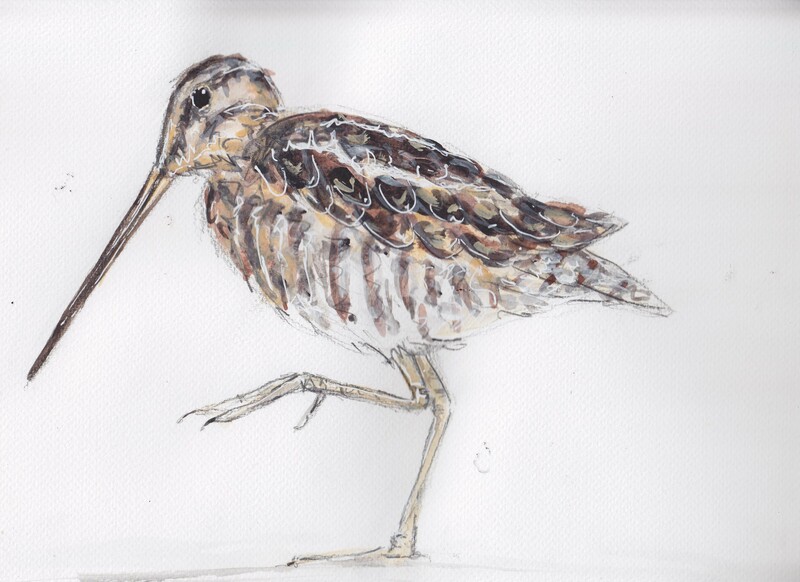 A Snipe with amazing legs! They visit us at a very beautiful lake not far from my home. Stithians Lake is managed by the South West Lakes Trust with the help of a Cornwall Bird Watching Preservation Society warden which means that it is fully equipped with some very well positioned hides. 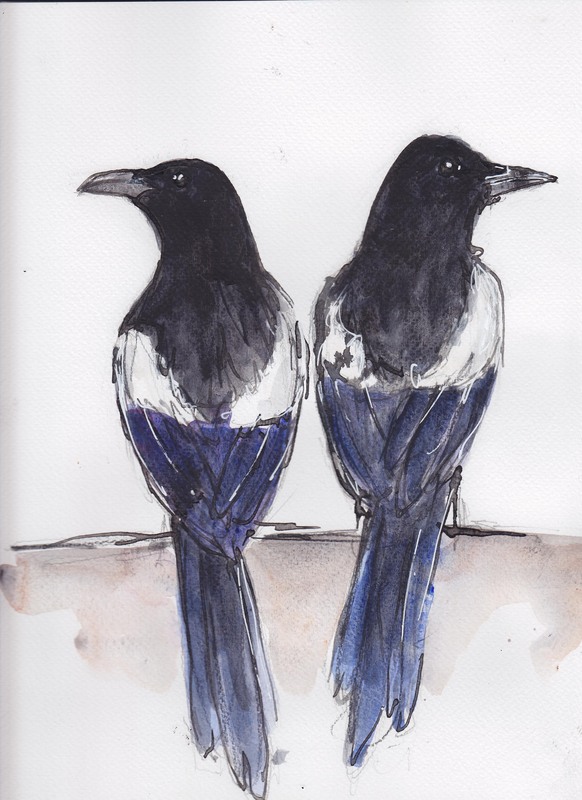 Many of the birds I will paint have probably been viewed here. 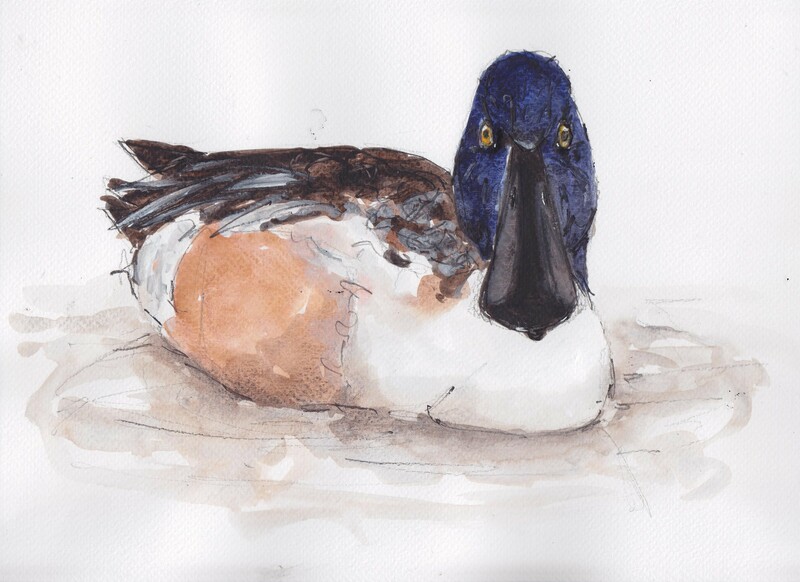 A Shoveler for day 5. I first saw one of these extraordinary birds at Slimbridge Wildfowl and Wetlands Trust where I had an exhibition a few years ago. Nothing like the vastness of the sea a few Harbour porpoises and a chat with my Mum to bring all my questions into focus!!! So now what should I do about all these thoughts, I am committed to this Challenge so how can I make it more useful? Now less than 1 week in I am questioning the whole idea of this challenge in terms of my own creativity (it was inevitable that this would happen…I am always like this) All the usual What is the purpose of life/art questions washing around my mind!!! By now the pace of 1 a day was killing me!!! 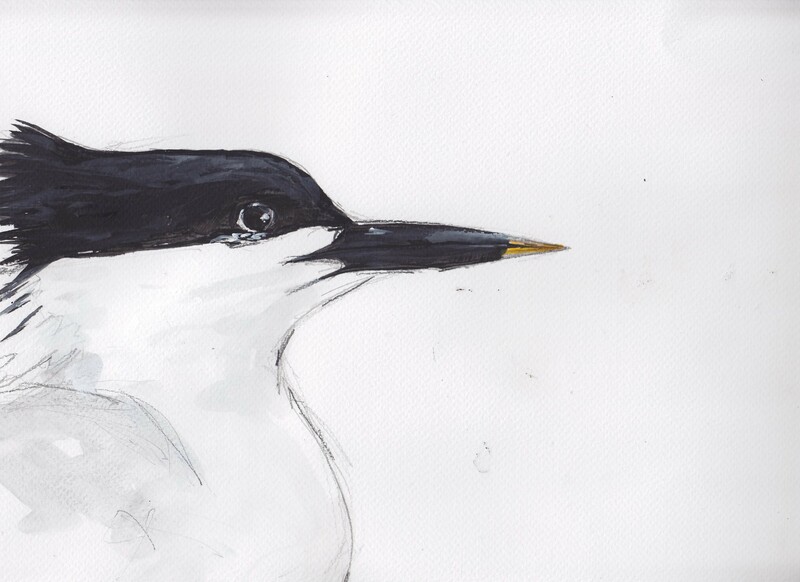 In July last year took a kayaking qualification with Hayle Canoe Club and one lovely evening the sky was full of these elegant and beautiful birds and their close relatives. I couldn’t just paint one of them! So I upped the pace…a lot! I had a bit of a painting marathon, October and November are looking incredibly busy so I thought I should try to get a bit ahead of myself over the next few days. In light of my change of pace, I decided to changes my self defined rules too. I only sent out 1 painting though because scanning, putting on website etc takes almost as long as the paintings. Also thanks to my Dad for reminding me, I included here for one of the Radio 4 Tweets of the day for you too…. I am off to be graduated from Falmouth University later it is over a year since I completed my Master of Art in Illustration Authorial Practice (with distinction 🙂 !!!) I am not sure where the time has gone but it may be this acting as a catalyst for my slight mental crisis around the charity challenge (more on this next time). My email went out an early today with the paintings made yesterday and today, I think I had defined a new challenge…. how many can I paint in 24 hours! Once I get everything set up though I do work quickly and because this is pure observation, working from photographs that I already have I am able to get a lot done in a day. I cant sustain this for any period of time though, as I either run out of images or inspiration or it starts to feel like factory work and a little pointless…especially when the paintings have a price tag. Funny how adding a monetary value always devalues the meaning/purpose/point of things. Or is that just me? I changed the rules slightly today too, to reflect my thoughts over the last few days and to keep it all simple. Now all the paintings, drawings and sketches will be £50 including (UK) P & P with 50% to go to the 3 charities, hopefully they will be affordable (I always relate affordable to a tank of fuel for some reason!) , I will cover my costs and we will raise a little money for charity. 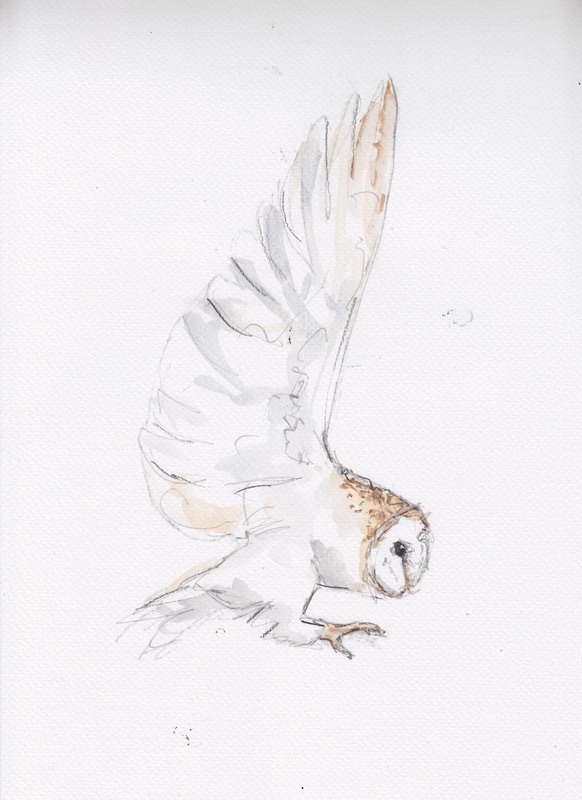 All the paintings, drawings and sketches so far can be found here . Please feel free to share my emails and facebook posts far and wide. I have so many things to say about my new challenge I thought it best to write a blog post. First of all I would like to thank everyone so very much for liking and sharing all my posts it has made a huge difference. As promised today I made a prize draw for the winner of a pack of cards…and the winner is……….Sandra Kaighin, congratulations to you! Also I have to thank and say thank you and welcome to all my new facebook, wordpress and twitter followers…I questioned if I could reach 1300 by the time I started my challenge and was amazed to have exceeded that figure by 17. So a big welcome to you all. 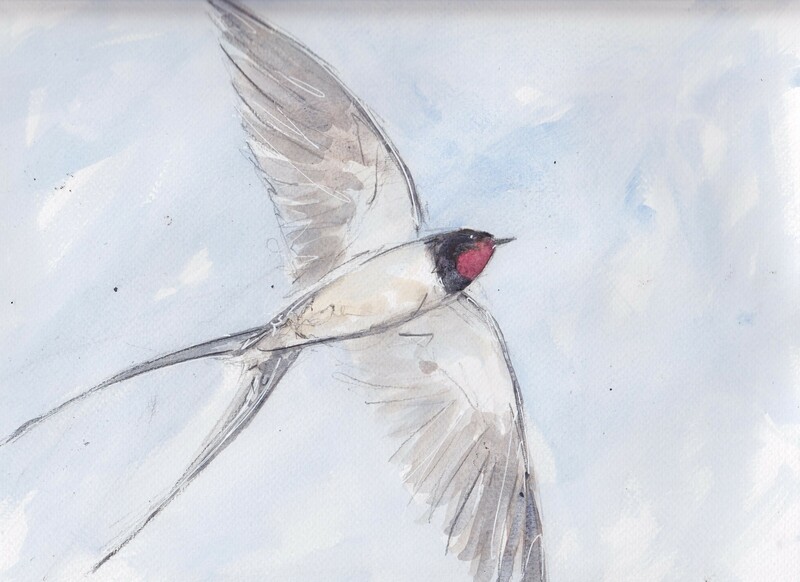 I have now sent my first set of ‘100 Things Wild’ paintings out to my mailing list to and feel very excited about the next 100 days who know where they will take me. If you would like to be first to see the paintings as I finish them each day it is easy to subscribe to my mailing list here and easy to unsubscribe too. 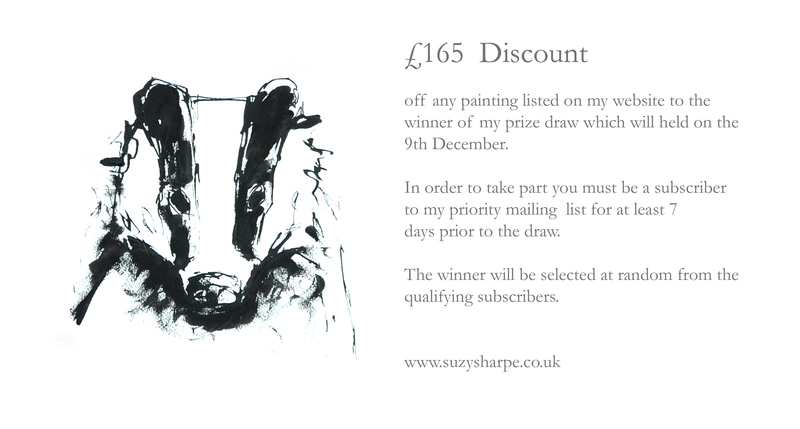 Here is a little incentive to join my mailing list! 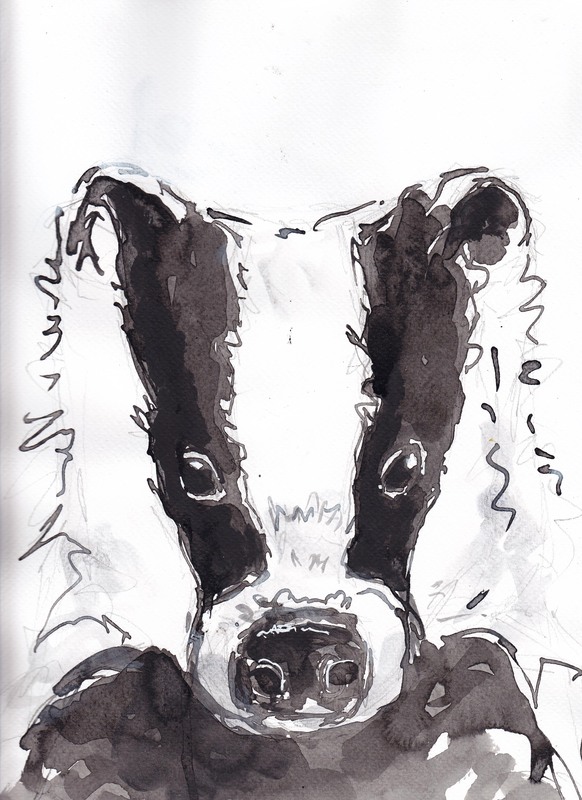 I stayed with the Badger theme for my paintings today and here they are…Badgers are very much in the news at the moment so it seemed fitting to start with them. The question is having painted 3 of them is that 3 off my 100 Things or only 1? I am still thinking about that one!